This article by MaryAnn F. Khol represents the ideas and philosophies that The Paint Box follow. Sit back, relax, read this article and feel good about your child making lots of art, at school, at home or with us! Have you ever seen a child smooth cool finger paint over a sheet of paper with both hands, pulling her fingertips through the paint to make squiggles? Or observed a child coloring in bountiful spirals with crayons? If yes, then you have seen the concentration on these children's faces, and the joyful expressions of art explored. You have witnessed creative art in process! Seven parents who do art activities with their kids on a regular basis were asked, "Why is art important?" Their answers appear throughout this article. Most of us instinctively know that art is important for our children; we simply believe it's important because we've seen our children deeply involved in art. But beyond what we feel and believe, there is much factual information about why art is important in our children's development that is both interesting and helpful to know. Creating art expands a child's ability to interact with the world around them, and provides a new set of skills for self-expression and communication. Not only does art help to develop the right side of the brain, it also cultivates important skills that benefit a child's development. But art goes far beyond the tangible statistics measured by studies -- it can become a pivotal mode of uninhibited self-expression and amazement for a child. Art matters the same way language matters -- or the way breathing matters! It is a fundamental component of what makes us uniquely human. Ashley said, "Sometimes art is just fun with no purpose or reason, just creating, getting messy, and the joyful expression of being a KID! Communication Skills: When a child draws a picture, paints a portrait, or hangs buttons from a wobbly mobile, that child is beginning to communicate visually. A child may draw to document an actual experience like playing in the park, release feelings of joy by painting swirling colors, or share an emotionally charged experience like the passing of a loved one through art. Art goes beyond verbal language to communicate feelings that might not otherwise be expressed. Diana said, "My kids express things through their art that they don't even have words for yet." Problem-Solving Skills: When children explore art ideas, they are testing possibilities and working through challenges, much like a scientist who experiments and finds solutions. Should I use a shorter piece of yarn to balance my mobile? This tape isn't holding -- what should I try instead? How did I make brown -- I thought I made orange? Art allows children to make their own assessments, while also teaching them that a problem may have more than one answer. Instead of following specific rules or directions, the child's brain becomes engaged in the discovery of "how" and "why." Even when experimenting or learning how to handle art materials effectively, children are solving challenges and coming up with new ways to handle unexpected outcomes. Lindsay said, "Art helps my kids feel willing to try new ideas, to experiment, to solve problems." Social & Emotional Skills: Art helps children come to terms with themselves and the control they have over their efforts. Through art, they also practice sharing and taking turns, as well as appreciating one anthers efforts. Art fosters positive mental health by allowing a child to show individual uniqueness as well as success and accomplishment, all part of a positive self-concept. Fine Motor Skills: Fine motor skills enable a child do things like delicately turn the page of a book or fill in a sheet of paper with written words. Holding a paintbrush so that it will make the desired marks, snipping paper with scissors into definite shapes, drawing with a crayon, or squeezing glue from a bottle in a controlled manner all help develop a child's fine motor skills and control of materials. Marta said, "After my kids spend time creating process art, they focus better in math, science, and other academic assignments." Self-Expression and Creativity: Children express themselves through art on a fundamental level. Sometimes their artwork is the manifestation of that expression, but more often, the physical process of creating is the expression. Picture the toddler who has a new baby sister busily pummeling his fists into Play-Doh; a six-year-old joyfully painting flowers with huge arm movements blending, reds and yellows; a ten year-old drawing a portrait of her grandmother who recently passed away. Creating art allows children to work through feelings and emotions, and referring to a finished piece of artwork helps a child talk about feelings in a new and meaningful way. Art also develops a child's creativity. Rather than being told what to do, answers and directions come from the child. Art is an experience that requires freethinking, experimentation, and analysis -- all part of creativity. It is important, however, to separate the notion of "talent" from "creativity" -- a child does not have to create a masterpiece to have a meaningful artistic experience. Art is a process, not a product. It's tempting to want our children's art to turn out "cookie-cutter perfect" to prove that they are successful and on track. It's reassuring to know that we can relax! Where art is concerned, it is the process of creating -- exploring, discovering, and experimenting -- that has the greatest value. Through self-expression and creativity, children's skills will develop naturally, and their ability to create will soar. 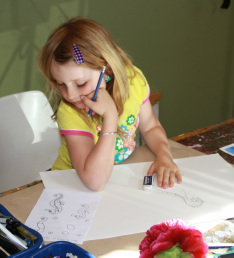 Marti said, "It seems art is the one area where kids and their creativity have free reign." MaryAnn Faubion Kohl, award-winning author, publisher, and educational consultant, has devoted her professional life to children's art and creativity. Her philosophy, "It's the process, not the product," guides her writing as she provides open-ended art activities for children of all ages. MaryAnn's books focus on the child's exploration and experience of art, not the final product. She launched Bright Ring Publishing, Inc. in 1985 with her first book, Scribble Cookies (new edition Scribble Art), now celebrating its 25th Anniversary.